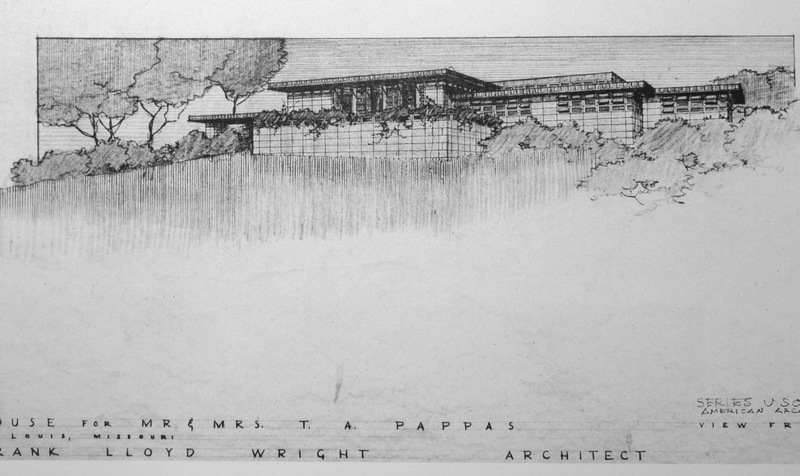 Wright Chat :: View topic - Article: Can the Pappas House become a museum? Article: Can the Pappas House become a museum? 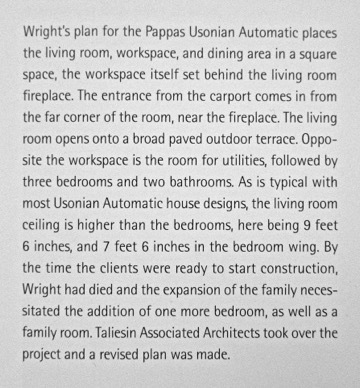 Posted: Tue Mar 19, 2019 8:57 am Post subject: Article: Can the Pappas House become a museum? The numerous fresh photographs here are particularly welcome . 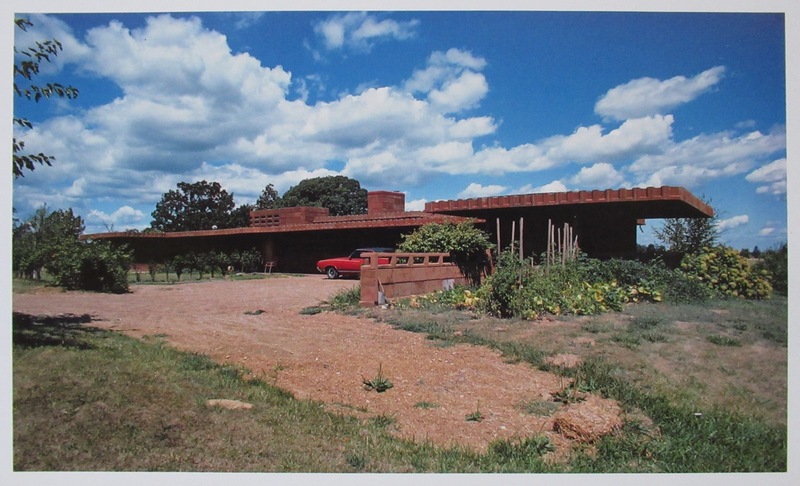 This is presumably the only Usonian which from the start has been painted, inside and out, in a strong color. I really like it. Imagine what it would look like with multiple furnishings, accessories, and/or textiles in, say, turquoise . . . Painted? I don't think so. The color of the block was, I believe, determined by the color of the earth in that area. 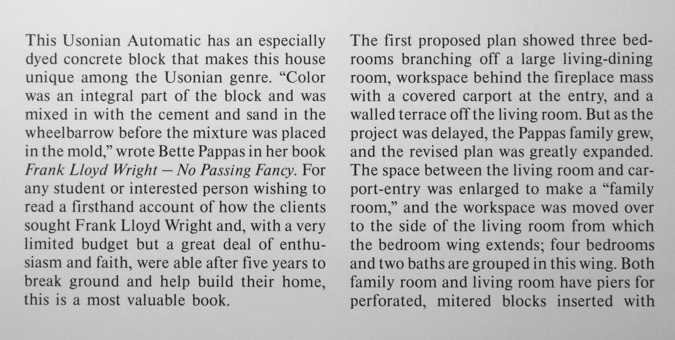 Not sure about that, but considering Betty Pappas' devotion to doing things with exacting care, it would be strange for her to have painted the house. And yet, turquoise furniture would indeed look good in the house. the unusual color, it is surprising (to me) that Pfeiffer and Storrer both are mum on the subject. Considering the strength of the hue, there must be a lot of earth in those blocks . . . ! Yes, they are not painted. It is incorporated into the block. How? I have no idea. The new interior photographs are some of the only ones to ever be released besides Bette's book. 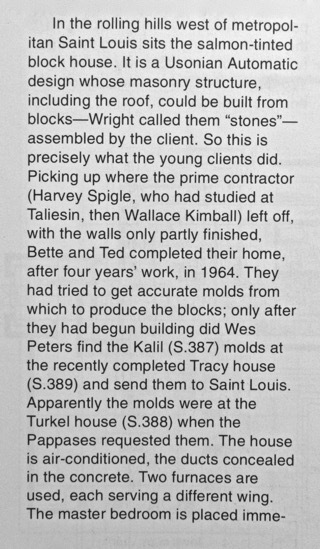 I knew an architect in St Louis that met FLW in person, but never got inside of the Pappas house. It just was not opened often. I hope they can open it up, there is a elementary school adjacent to the property which would be a nice educational spot for kids. I was also told they are working on a GoFundMe page for raising funds. Thanks, Hypno ! Long time no see . . .! I love that house, and would like to see it---sooner or later. It's great to have the photos. For now, I'll be offline for 24 hours or so, while my Mac mini gets some new hardware. Carry on . . . 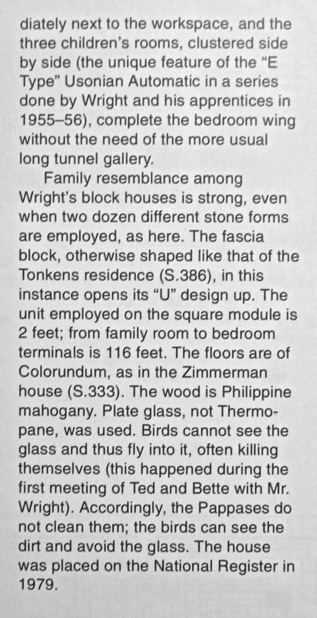 I understand that Wright made colored blocks by mixing powdered tint directly into concrete. He did this at least as far back as Richard Lloyd Jones (which is greyish-purple under the paint). For floor slabs the builders applied powder to wet concrete and spread it with a rubber blade, letting it bond as the concrete hardened (something like a fresco). Pappas appears to use both. I guess they must have used a LOT of pigment at Pappas. Perhaps we shouldn't be surprised that this wasn't done more often. Now the big question: Did Mr Wright propose the color at Pappas ? There has been considerable discussion here in the past about the coloring of the Usonian slab. I believe I have a photo of original Colorundum containers from one of the houses . . . Possibly the asking price is too high for a preservation minded buyer who will want to OWN and LIVE in the house. Put preservation easements on it and sell it to a preservation minded buyer... the easements are the only sure way to protect these houses, and they are not an impediment to the preservation minded buyer. Though I’m all for public exposure to Wright’s works, I’m leery of a perfectly viable house becoming yet another house museum. I’d hope the directors of this venture, if it comes to pass, consider sleep-over options if they find themselves short of revenue eventually. It appears that TAA considerably altered the plan in the process of enlarging it. 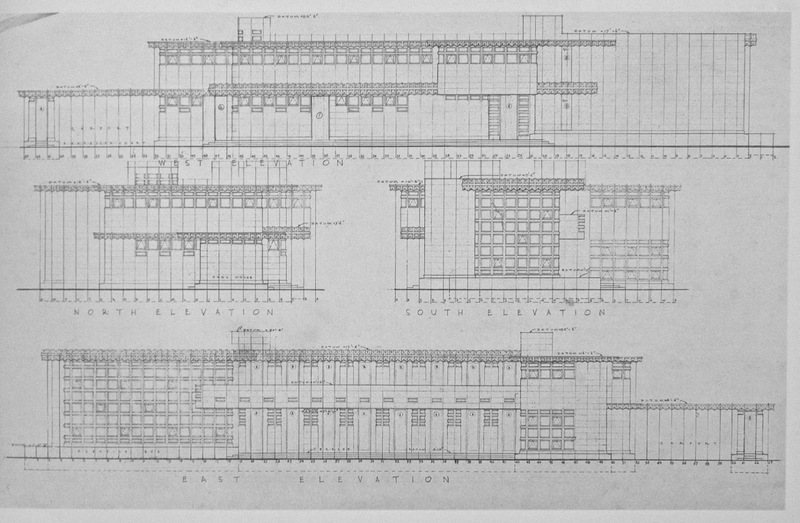 Each Usonian Automatic has its own set of drawings, likely by different apprentices. Turkel is mentioned in the Pappas story; here are the two elevation sheets. They make an interesting contrast. 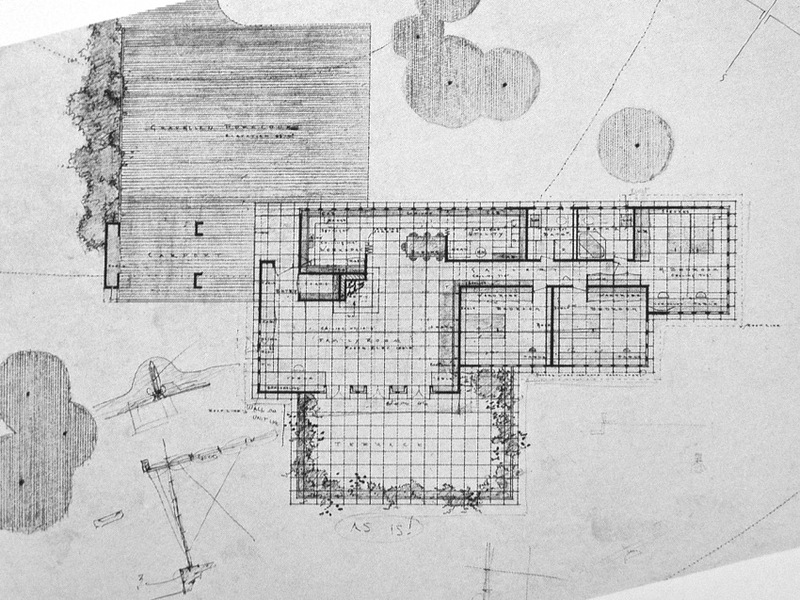 It should be remembered that the Pappas drawings in the Monograph illustrate the initial design . . . 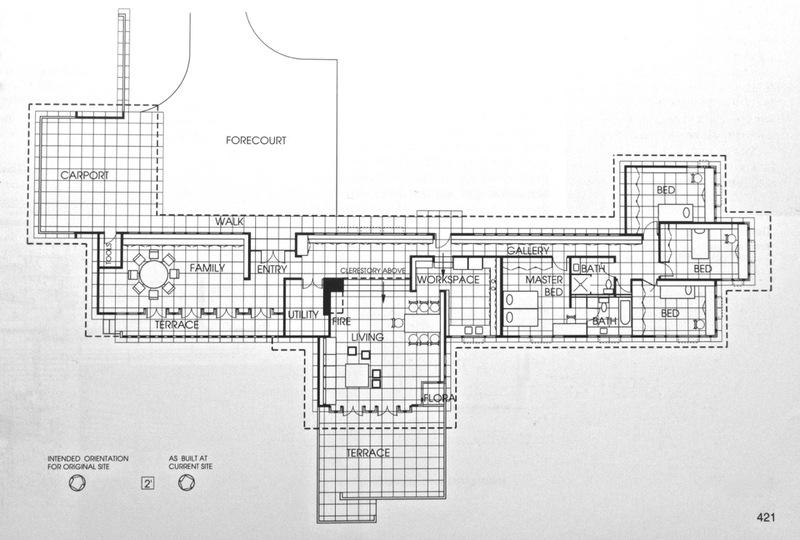 Question: Have any of Wright's homes that have been operated as museum-type-things been lost, either to demolition or to significant altering? Some (May, Martin, Westcott, Robie) had been badly messed with before they became public attractions, but they are back to their original glory. The Guggenheim exhibition house is the only case I know of an actual dismantling. I believe that the Usonian automatic that traveled with the exhibit ca. 1990 eventually became a home next to TWest. There is also the Peterson Cottage, which was forlorn before it was salvaged on the edge of collapse. 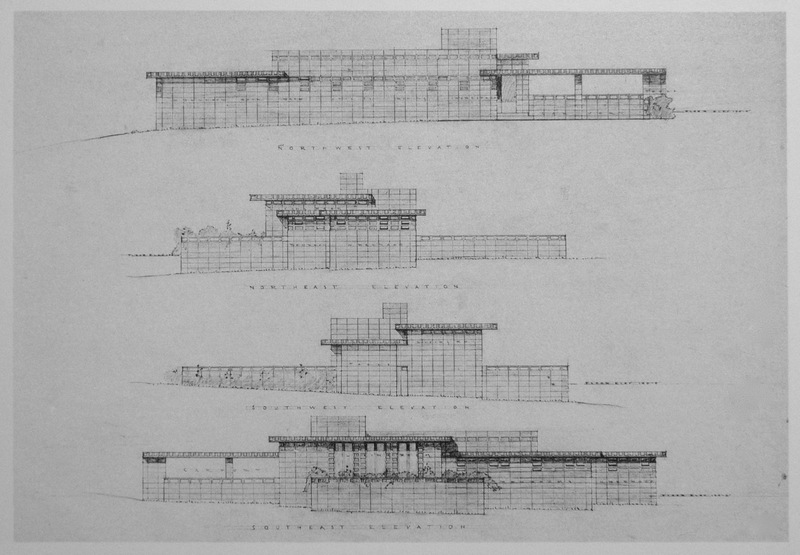 I don't think the traveling Usonian Automatic exhibit house could have been made permanent and habitable, as it was made of wood products exclusively. Pieces of plywood and particle-board or OSB "masonry" can be seen in front of the house, in this photo.